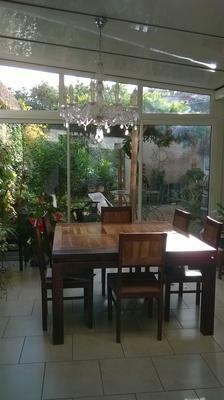 Beautiful house for sale in the center of Albi, ideally situated in the French southwest. Easy access. 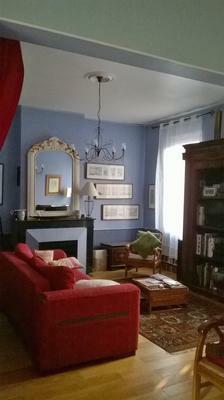 Beautiful old townhouse, tastefully renovated. Exposed stone walls, high ceilings, lots of character. Wooden floors or tiles throughout. Roughly 140 sq meters, plus several garden sheds for storage. Full reversible AC. New hot-water tank. 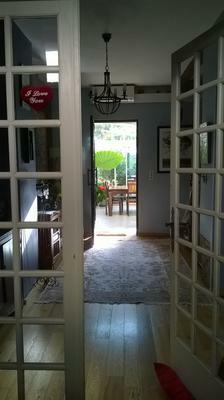 Large entry hall leading to open plan cozy family room with pellets stove in original fireplace. Fully equipped kitchen leading on to large fully insulated conservatory-dining room with sliding glass doors to flowered patio. Toilet. Large bedroom (roughly 20 sq.meters) with walk in closet (4 additional sq meters). Study off bedroom (9 sq m), can be used as bedroom for baby or young child; a separate entrance can easily be created to have two fully independent bedrooms. Alternately, you can very easily convert the study into a second bathroom to create an en suite space. Spacious bathroom with shower AND spa bath plus toilet. 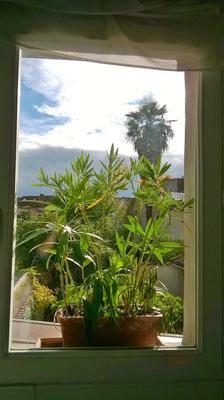 Large window with beautiful view of gardens and rooftops. two very light bedrooms with slanted ceilings (fully insulated attic) with nice views on gardens and rooftops. Lovely flowered patio, very private, sunny in winter but shaded by wisteria on arbour. Countrystyle garden, roughly 300 sq meters: various trees, bushes and flowers (apple, pear, cherry, olive, etc), ornamental pond with goldfish and waterlilies… Three sheds, roughly 20 sq meters in total: one shed can be converted into studio flat. Ideal situation on very quiet street 1mn walk away from train station (but absolutely no noise), in quiet neighbourhood with all sorts of shops. The city centre is less than 10 mn away on foot: theatres, galleries, cinemas, world famous cathedral and quaint old city streets. Beautiful public gardens nearby. The region is world renowned for wonderful scenery, hiking and biking, lakes, good food and hospitality. It is possible to rent one or two car spaces (45€/month per car) in locked parking site 10 meters from the house, or it is very easy to park right on the street. Albi is only a 50 minutes drive away from Castres Mazamet airport, one hour from Toulouse Blagnac airport, just over an hour from Rodez airport (cheap flights available to and from the UK and Ireland).